In October 2012, the world watched in awe as the Austrian daredevil Felix Baumgartner skydived from 24-miles above terra firma as part of Red Bull Stratos. For all intents and purposes he leapt to earth from space. The vistas of the planet from Baumgartner’s capsule alone made the official video nothing short of spectacular. Two things, one obvious and another probably little noticed by other viewers, drew me to this Evel Knievel to the nth level stunt. First, he parachuted to earth, an experience that since World War II had gone from purely military endeavor to something also done as leisure. Certainly his leap of faith was laborious and made money for a lot of people (including the energy drink brand Red Bull, which backed the Stratos program). But as I see it, Baumgartner is at the vanguard of a burgeoning, albeit hardly egalitarian, space tourism industry. Space tourism is big talk in the American West. Oklahoma, California, and Colorado all have planned privately or publicly funded spaceports that cater to high-end tourism. New Mexico’s Spaceport America, a stone’s throw west of White Sands Missile Range and about 60 miles north of Las Cruces, is perhaps the most famous. 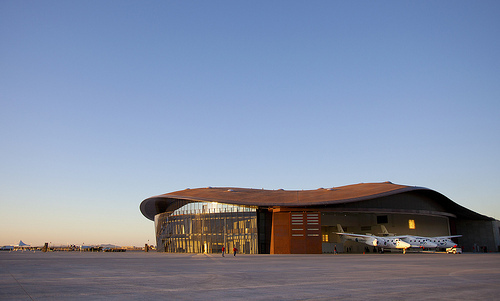 In 2009 Sir Richard Branson’s Virgin Galactic planned to house its headquarters there. Second, Baumgartner plummeted to earth near the alien sighting capital of the world, Roswell, New Mexico, where Stratos had headquarters for the jump. Space tourism reminded me of the deep ties that space exploration has held in the American West. When we think of American space exploration we think of Houston, Texas, Huntsville, Alabama, and Cape Canaveral, Florida. But early on the West was at the heart of it all. For Example, Edwards Air Force Base (formerly Muroc Army Airfield), located on the high desert of California, housed post-World War II test pilots that tested high altitude and high-speed airplane prototypes (Chuck Yeager was a part of this “weird ribald aerial tarpaper mad-monk squadron,” as Tom Wolfe called them). In the 1970s, Edwards also played a central role in Space Shuttle testing. New Mexico holds a special place in the history of space technologies. Beginning in 1930, physicist and inventor Robert H. Goddard initiated the earliest rocket research in New Mexico after leaving the less than inviting community and climate of New England. As World War II ended German and American scientists led by German engineer Wernher Von Braun came to Fort Bliss and White Sands Proving Ground in south-central New Mexico to initiate the American V-2 rocket program. White Sands would test several rocket prototypes including the Viking, Athena, and Pershing. In 1949, U.S. Secretary of Defense, James Forrestal, paid lip service to an earth satellite vehicle as future military tool based in part on the secret research at White Sands. 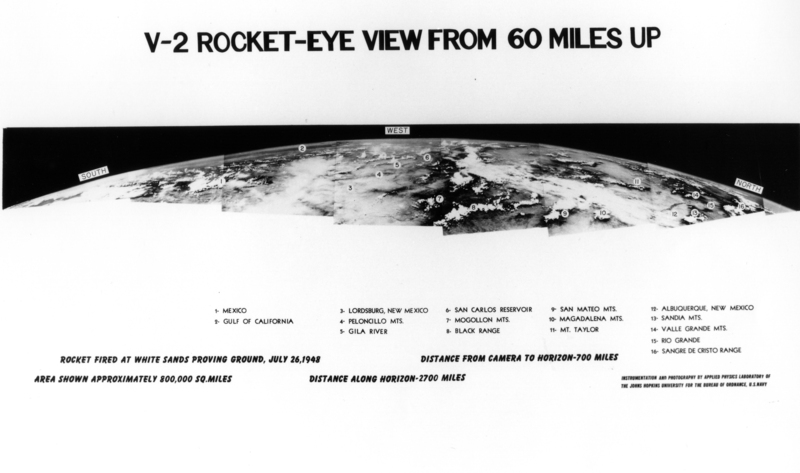 As part of high altitude research conducted during the V-2 program, engineers and scientists also hurtled metal slugs into space and took photos of the earth from high altitudes. Both experiments are important ancestral events to Baumgartner’s flight (you really cannot have his capsule without the slugs nor the compelling images of the video from his capsule without early experiments with high altitude rocket photography). In 1963, engineers and scientists at the White Sands Test Facility researched propulsion system prototypes for the already underway Apollo program (WSTF remains active). In March 1982, the Space Shuttle Columbia landed at the White Sands Space Harbor. So Richard Branson had planted his space flag in the deserts of southern New Mexico with the help of New Mexico politicians, Congress, local boosters, and a history of space research to prime the pump. But a story all too familiar to western historians seems to be playing itself out. The benefits of this leisure and industrial program seem only to benefit a small wealthy slice of the public, a public with either ancillary or zero ties to the everyday realities of most New Mexicans. Indeed, in 2010 Virgin Galactic marked the price for a two hour round trip at $200,000. 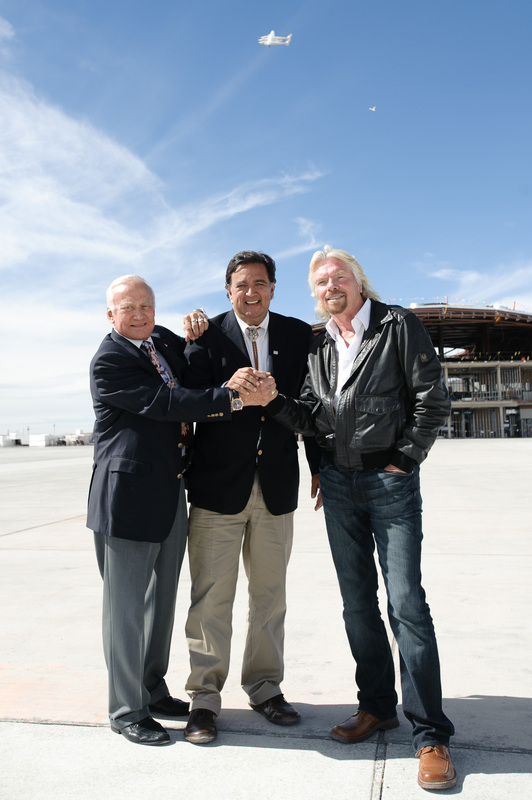 While his company has started paying rent, Branson has threatened to abandon Spaceport America unless the New Mexico state legislature offers liability exemptions to Virgin Galactic suppliers. Considering the amount of money the state has poured into the program (two-thirds of estimated $209-212 million cost) this may be shocking to most New Mexicans. But lets not act surprised. Branson is looking at Abu Dhabi as an alternative launch site (Oklahomans may recall a similar song and dance). In some senses, New Mexico offers a wonderful environmental climate for such endeavors including year-round sun, high altitude, and little precipitation (clearly the positive reception from Santa Fe does not hurt either). Baumgartner did not pick New Mexico by mere whimsy and seeing New Mexico from 24-miles up is a thrill. He also shows that for a sliver of the population space tourism is possible. But in a state with one of the highest poverty rates in the country, which has also experienced abominable social and environmental exploitation as the result of extractive natural resource industries and Cold War military agencies (read here, here, and here), Spaceport America seems like nothing more than a big empty terminal with a runway to nowhere.